Small petrel (L 26 cm) with rose legs, long tail and dark plumage uniform, except for a paler bar. Rough nests are made in burrows, which may be excavated in the ground or may be already exists as crevices in walls or rocks. 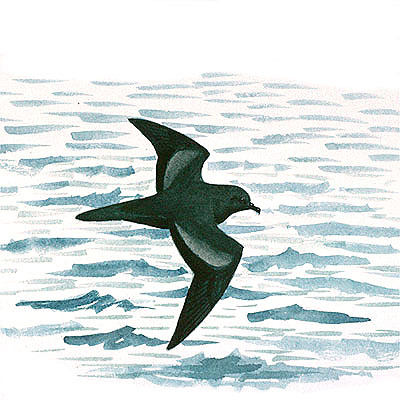 Bulwer's Petrel is a pelagic seabird feeding on the surface off squid, plankton and small fish. Migrant. In the past, human predation affected Bulwer's Petrel. Since the declaration of the breeding areas as Nature Reserves, the prospects for this petrel have improved enormously. The species is heavily predated by the increasing population of Yellow-legged Gull (Larus cachinnans) and by rats and cats.